Frank Walter BURGESS (1867-1899) - Photographer active in Ringmer during the 1890s. Frank Walter Burgess was born in Ringmer in 1867, the son of Eliza Ledbetter and Henry Burgess, a retired butcher who originated from Cuckfield. [The birth of Frank Walter Burgess was registered in the district of Lewes during the 3rd Quarter of 1867]. Henry Burgess (c1806-1901) was the grandson of John Burgess (c1751-1825), a Baptist minister who served a congregation in Ditchling in the 1780s. Henry Burgess, who had been in business as a butcher in Brighton during the 1840s, was, by 1851 earning an income from owning houses. The 1851 census records Henry Burgess, a 45 year old "Proprietor of Houses" living with his first wife Elizabeth at 1 Hampton Terrace, Brighton. Also living at this address was Mr and Mrs Burgess's servant, 16 year old Eliza Ledbetter. * (Eliza's surname was variously given as Ledbetter, Lidbetter or Libbiter). Mrs Elizabeth Burgess, Henry's first wife died in Brighton around 1864. A couple of years later in 1866, Henry Burgess, who was then aged around 60, married his former servant, 30 year old Eliza Ledbetter (born 1835,Burwash, Sussex). Frank Walter Burgess was probably Henry and Eliza's only child. When the census was taken on 3rd April 1881, Henry and Eliza Burgess and thirteen year old Frank were residing at The Villa, Ringmer. On the census return, Henry Burgess, Frank's father, is recorded as a "Retired Butcher", aged 75. 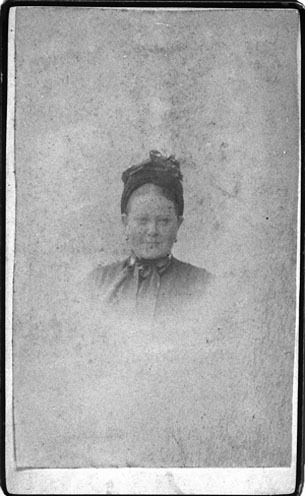 Mrs Eliza Burgess, Henry's wife, was was thirty years his junior, informed the census enumerator that she was born in Burwash, Sussex, around 1835. 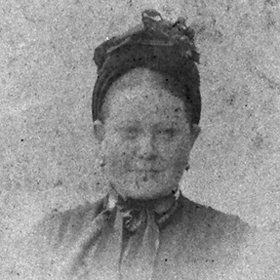 Mrs Eliza Burgess, Frank Burgess's mother, died in Ringmer during the 2nd Quarter of 1888, at the age of 53. When the 1891 census was taken, twenty-three year old Frank Burgess was residing at The Villa, Ringmer Green, with his widowed father, a young visitor, and one live-in servant. On the 1891 census return, Frank Walter Burgess gave his occupation as "Photographer". [ABOVE] Frank Burgess recorded as a "Photographer" in the 1891 census. On 15th August 1893, at Ringmer, Frank Walter Burgess married Mary Ann Paris, the daughter of Mary Pockney and the late Albert Edward Paris (1844-1873). Since the death of her husband in 1873, Mrs Mary Paris (born 1837, Ringmer), Mary's widowed mother, had been running a grocery and drapery business on The Green, Ringmer. Mary Ann Paris, Frank's bride, was born in Ringmer on 1st August 1871, and was Mrs Paris's youngest child. The union of Frank Walter Burgess and Mary Ann Paris produced three children - Douglas Spencer Burgess (born 1895, Ringmer), Una Burgess (born 1896, Ringmer) and Beatrice Cicely Burgess (born 1898, Ringmer). The 1895 edition of Kelly's Directory of Sussex records Frank Walter Burgess at Ringmer Villa, Ringmer, yet by 1899, Kelly's directory lists the Burgess residence as St George's Villa, Ringmer. (John Kay has identified Frank Burgess's villa as the house now called 'Ashcroft', next to Ringmer Village Hall). John Kay of the Ringmer History Study Group informs me that, as the son of a prosperous Brighton butcher, Frank Walter Burgess was a "gentleman of some means" and was not dependent on a professional career. John Kay reports that as young man Frank Walter Burgess derived some income as a music or dancing teacher and later as an "antiquarian bookseller". Frank Walter Burgess began dealing in rare books in the 1890s and is known to have had a particular interest in printed books and manuscript papers concerning art and poetry, purchasing works authored by William Blake, Percy Bysshe Shelley and John Ruskin. Frank Burgess was in regular correspondence with William Michael Rossetti (1829-1919), a literary and art critic and the younger brother of the Pre-Raphaelite artist and poet Dante Gabriel Rossetti (1828-1882). Frank Burgess purchased from William Michael Rossetti manuscripts written by D. G. Rossetti, drawings and verses by William Blake, and many other literary works. (There are around 60 extant letters from William Michael Rossetti to Frank Burgess and forty-eight of the letters written by Frank Burgess to William Michael Rossetti have also survived). In addition to buying and selling books, Frank Walter Burgess was also a noted bookbinder and book cover artist. In 1896, Frank Walter Burgess became a member of The Sussex Archaeological Society. Frank Burgess had earlier shared the contents of his great grandfather's diary, "The Journal of John Burgess" with The Sussex Archaeological Society. Frank Walter Burgess died in Ringmer on 11th July 1899 at the age of 31 following a bout of rheumatic fever. After the death of Frank Burgess, William Michael Rossetti corresponded with his widow, Mrs Mary Ann Burgess. The seven surviving letters written by William Rossetti to Mrs Burgess suggests that she continued her late husband's dealings in books and manuscripts for a period of time. By 1911, Mary Ann Burgess was running a boarding house at 25 St Anne's Crescent, Lewes, where she resided with her three children. Mrs Mary Ann Burgess, the widow of Frank Walter Burgess, died in Ringmer on 2nd November 1955. [ABOVE] Frank Walter Burgess as a very young boy, photographed with his father Henry Burgess (c1806-1901) in a studio portrait dating from around 1871. Henry Burgess had married his second wife, 30 year old Eliza Ledbetter, when he was close to 60 years of age. In this studio portrait, Henry Burgess, then in his mid sixties, is dressed in the uniform of the Sussex Volunteers, in which he served for many years. [ABOVE] Frank Walter Burgess (1867-1899) photographed on his wedding day in August 1893. Frank Burgess began taking photographs as a young man and by 1888 he was exhibiting his photographic work in Ringmer. Frank Walter Burgess probably became interested in photography in his teens and by his early twenties he was a keen amateur photographer, showing his photographs at local exhibitions. 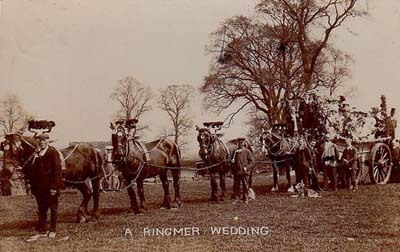 In 1888, a local newspaper reported that Frank W. Burgess exhibited a number of photographs at the Ringmer Cottagers' Show. An account in The Eastbourne Chronicle, dated 1st September 1888, noted that the photographs of Mr F. W. Burgess, displayed at Middleham in Ringmer attracted some attention, judging "several of them being very good for an amateur". Encouraged by the favourable response to his photographs, Frank Burgess set himself up as a semi-professional photographer in Ringmer around 1890. 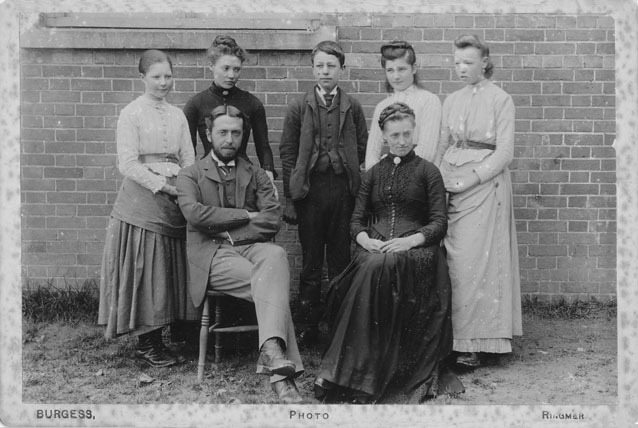 In May 1890, Frank Burgess was commissioned to take several group photographs of the staff and pupils at Ringmer Board School. [See the group photographs illustrated left and below]. 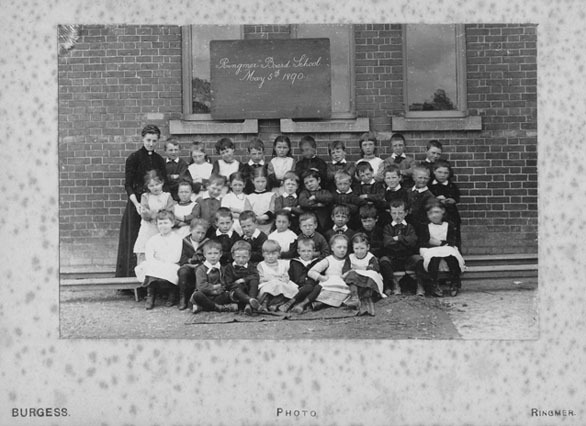 The school group photographs were professionally mounted on card, printed on the border with the photographer's credit "BURGESS, PHOTO, RINGMER". When the census of Ringmer took place on 5th April 1891, Frank W. Burgess, then aged only 23, gave his occupation as "Photographer". There is evidence that during the early 1890s, Frank Burgess was able to supplement his income by taking individual photographic portraits of the inhabitants of Ringmer. In March 1892, Frank Burgess placed an advertisement in the parish magazine publicizing his photographic portrait studio. Burgess also used his camera to record weddings and other significant social occasions in the village. It appears that Frank Burgess was primarily an "outdoor photographer" and he was often commissioned to take photographs of particular residences and important buildings in the Ringmer area. John Kay reports that Ringmer History Study Group has "a good number of local photographs" taken by Frank Burgess of Ringmer. Donald Burgess, the grandson of Frank Walter Burgess, holds a collection of Frank Burgess's photographs, which have been passed down from Douglas Spencer Burgess, the son of Frank and Mary Ann Burgess. It appears that Frank Burgess had his own darkroom at his villa in Ringmer. He was known to develop his own photographs and, on occasions, transferred the images to lantern slides. In 1895, Frank Burgess wrote to The Selborne Magazine recounting how he had made lantern slides from a series of photographic negatives "which proved a source of endless amusement and I hope taught a lesson in kindness to some hundreds of young people to whom they were shown this Christmas". 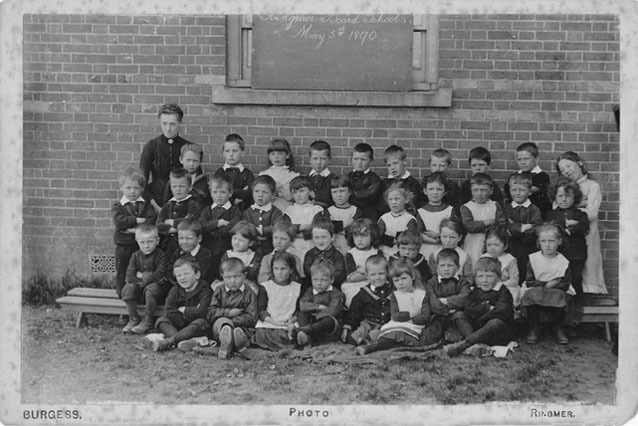 [ABOVE] Infant Class of the Ringmer Board School photographed by Frank W. Burgess of Ringmer (1890). Mrs Sarah Jane Jackson , the School Mistress of Ringmer Board School, stands on the left. (S35). [PHOTO: Courtesy of John Kay & Ringmer History Study Group - Photo Ref: S34] [ABOVE] Infant Class of the Ringmer Board School photographed by Frank W. Burgess of Ringmer (1890). Mrs Sarah Jane Jackson , the School Mistress, stands on the left (S36). Mrs Jackson's husband, Martin Luther Jackson, was the School Master of the Ringmer Board School . 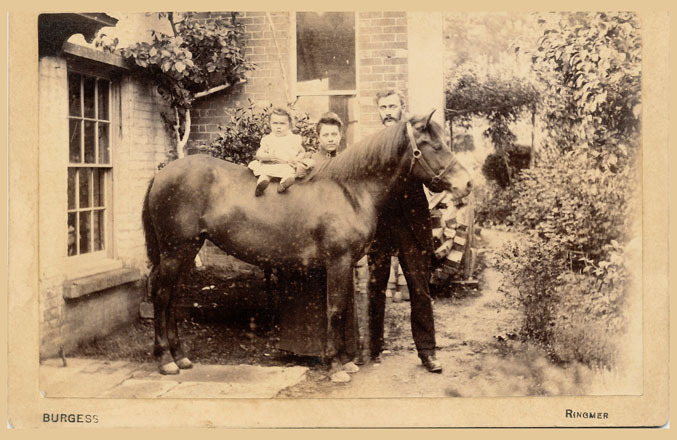 [ABOVE] A couple with their young child posing with their horse outside a house in Ringmer, a photograph by Frank Walter Burgess of Ringmer (c1890). Although Frank Burgess constructed a photographic portrait studio in his father's villa in Ringmer, many of his portraits were taken outdoors on location. [LEFT] A portrait of a young woman photographed by Frank Burgess in 1893. A written inscription on the reverse of the photograph reads: "Emily after death of her mother. In memory of my dear Sister. Brother George's wife just after her marriage. 1893, September. 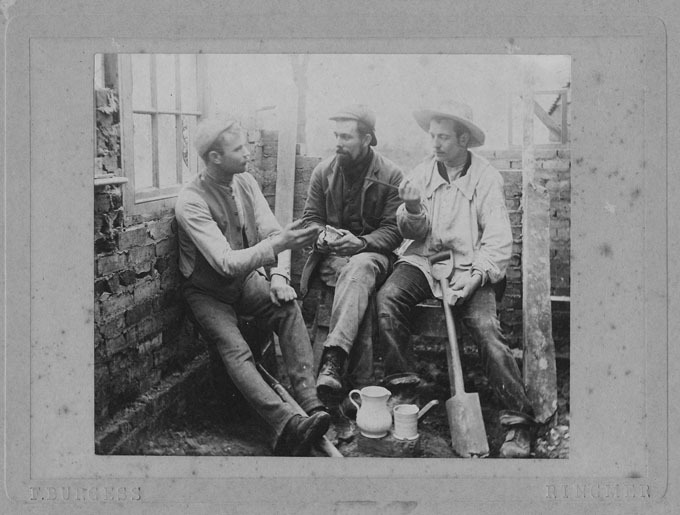 From Auntie Emma"
[ABOVE] A photograph by Frank Burgess of Ringmer showing three building workers taking a break. The men featured in the photograph were three brothers who lived and worked in Ringmer - Frank Washer (born 1869, Ringmer), a painter, Alfred Washer (born 1866, Ringmer), a bricklayer, and Frederick Washer (born 1868, Ringmer), a labourer. The photographic card mount is impressed "F. BURGESS, RINGMER". 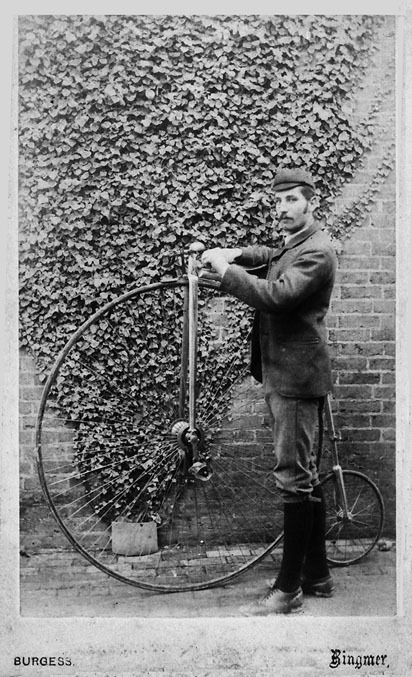 [RIGHT] Ringmer blacksmith, Charles Painter (born 1871, Isfield, Sussex) posing with his "penny farthing bicycle", a cabinet photograph by Frank Burgess of Ringmer. [ABOVE] The poet and artist Dante Gabriel Rossetti (1828-1882). Frank Walter Burgess (1867-1899), a young book dealer from Ringmer, Sussex, was keenly interested in the work of Dante Gabriel Rossetti and his circle. Frank W. Burgess purchased works by D. G. Rossetti, Edward Burne-Jones and John Ruskin. 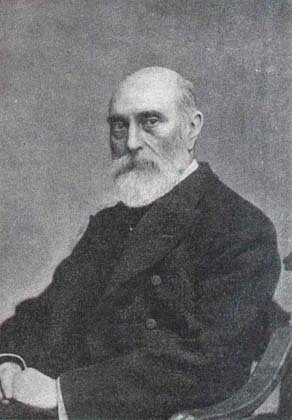 William Michael Rossetti was born in London in 1829, the son of Frances Maria Polidori, the daughter of an Italian exile, and Gabriele Pasquale Rossetti, an Italian poet and scholar who had settled in England in 1824. William Michael Rossetti was the third of four children born to Frances and Gabriele Rossetti. William's elder brother was Dante Gabriel Rossetti (1828-1882), a poet, illustrator and artist, who founded the Pre-Raphaelite Brotherhood in 1848. (William Michael Rossetti was a fellow member of the Pre-Raphaelite Brotherhood). Maria Francesca Rossetti (1827-1876), William Rossetti's eldest sister, was an author and translator who entered a monastic religious order at the age of 46. Michael's younger sister was the poet Christina Georgina Rossetti (1830-1894). After the death of his two famous siblings Dante Gabriel Rossetti and Christina Rossetti, W. M. Rossetti edited their work and preserved their manuscripts. In 1897, William Michael Rossetti entered into correspondence with Frank Walter Burgess (1867-1899), a bookseller from Ringmer who dealt in antiquarian books and rare manuscripts. 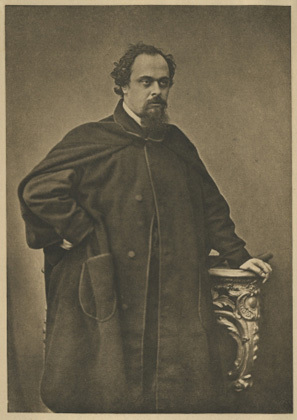 It is known that Frank Burgess purchased some manuscripts written by William's brother Dante Gabriel Rossetti. Burgess and W. M. Rossetti exchanged over a hundred letters during the two years leading up to Frank Burgess's premature death in July 1899. [ABOVE] The writer and critic William Michael Rossetti (1829-1919) photographed in the London studio of Elliott & Fry in 1894. William Michael Rossetti was in regular correspondence with Frank Walter Burgess between 1897 and 1899, the year that the young bookseller died. I am indebted to John Kay of the Ringmer History Study Group for providing biographical information on Frank Walter Burgess (1867-1899) and for supplying examples of the photographer's work. It was John Kay who first alerted me to the photographic activities of Frank Walter Burgess and without his contributions this section on F. W. Burgess would have been the poorer. I also have to thank the Ringmer History Study Group for collecting and safeguarding so much of Ringmer's history and making it freely available. I am grateful to Ashley Rose of Aldershot, Hampshire, for providing family history details for Mary Ann Paris (1871-1955), the wife of Frank Walter Burgess. Information about the bookselling activities of Frank Walter Burgess has been gathered from "Selected Letters of William Michael Rossetti", Edited by Roger W. Peattie (University Park, Pennsylvania State UP, 1990) and "Frank W. Burgess: Bookseller and Book Cover Artist" by Roger W. Peattie, an article published in The Book Collector ( Vol. 43, No.1 Spring 1994, pp 59-74). Other sources include The Eastbourne Chronicle, census returns for 1881, 1891, 1901 and 1911, editions of Kelly's Directory of Sussex (1878, 1890, 1891,1895, 1899 "Some Extracts from the Journal and Correspondence of Mr John Burgess of Ditchling, Sussex, 1785-1815" by John Sawyer (The Sussex Archaeological Society, 1896) and "The Selborne Magazine and Nature Notes" ( Vol. 6, 1895). As an employee of the London, Brighton and South Coast Railway, George Frank Burtt was required to take photographs of the steam locomotives built at the Brighton Railway Works. As a part-time photographer, George Frank Burtt also took photographic views of Ringmer and the surrounding area. According to Rendel Williams, author of the Sussex Postcards Info website, from around 1904, George Frank Burtt supplied his original photographs to two Brighton postcard publishers - The Mezzotint Company of London Road and York Hill, and the Brighton View Company of Clarence Street, Brighton. Around 1907, George Frank Burtt advertised himself as a professional photographer in Ringmer. Kelly's 1907 Directory of Ringmer places George Burtt under the heading of "Private Residents" with a home address of Ringmer Road, Ringmer. 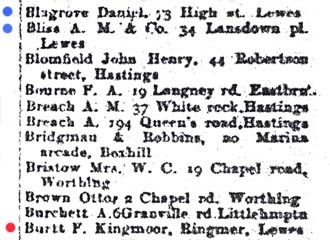 The Trades Section of Kelly's 1909 Directory of Sussex lists "F. Burtt" as a photographer at "Kingmoor, Ringmer, Lewes". ( George Frank Burtt preferred to be known as "Frank Burtt", but his photographs often carry the initials "G. F. B." and the picture postcards he published carry the credit "Photographed and published by G. F. Burtt, Ringmer, near Lewes - Sussex". Although he is listed as a professional photographer in local trade directories published between 1909 and 1911, George Frank Burtt continued to work as railway engine draughtsman for the London, Brighton and South Coast Railway. The census taken on 2nd April 1911 describes forty-year old George Frank Burtt as a "Locomotive Draughtsman". The 1911 census gives Frank Burtt's address as Tollgate, Ringmer, Lewes, Sussex. Sharing Frank Burtt's home was his wife Millicent, their nine year old son Frank Martley Burtt, a young niece Audrey Jewell Saxby (born 1904, Portsmouth) and a boarder, a twenty-five year old assistant teacher named William Victor May. 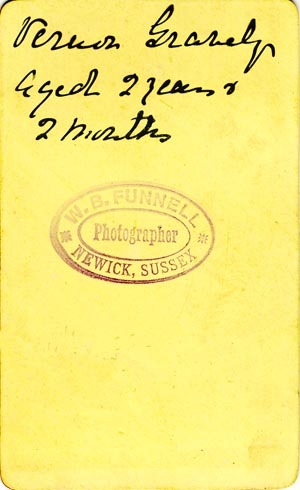 Frank Burtt ended his photography business in Ringmer when he moved to Malling Street, Lewes, round 1912. Frank Burtt's wife Millicent died in Lewes in 1919 at the age of 47. Frank Burtt remarried later that year. [The marriage of Frank Burtt to Mabel Knight took place in Brighton during the 3rd Quarter of 1919]. George Frank Burtt died in Brighton on 22nd August, 1949, at the age of 78. [ABOVE] Frank Burtt listed as a professional photographer based at Kingmoor, Ringmer, in the Trades Section of Kelly's 1911 Directory of Sussex. Also listed are the photographic studios owned by Daniel Blagrove junior and A. M. Bliss & Co.
[ABOVE] Rev. 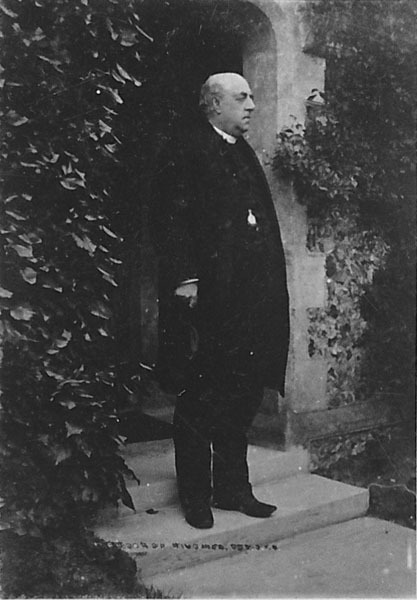 Frank Barrow Gribbell , M.A., B. D. Cantaur (c1840-1915), the Vicar of the Church of St. Mary the Virgin, Ringmer, photographed by (George) Frank Burtt around 1910. Frank Barrow Gribbell was born in Tavistock, Devon around 1840 [birth registered in the district of Tavistock during the 1st Quarter of 1840]. Frank Barrow was educated at Clare College, Cambridge, graduating with a Master of Arts degree. After attending University, Frank Gribble prepared for a religious career in the Anglican Church, receiving a Bachelor of Divinity degree from Canterbury. In 1865, Francis Barrow Gribbell, then a young clergyman, married Elise Mary Ann Morrell (born c1840, Dinan, France). Shortly after their marriage, Frank Gribbell and his wife travelled to Victoria in British Columbia, a colony on the western edge of Canada. Rev. Gribbell was placed in charge of St John's Church in Victoria and was later appointed Rector of St Paul's Anglican Church, Esquimalt on Vancouver Island. It was during his stay on Vancouver Island that Rev. Frank Gribble's three children were born - Elizabeth Florence Gribbell (born c1867), Gertrude Mary Gribbell (born c1869) and Arthur Frank Gribbell (born c1874). From 1870 until 1875, Rev. Frank Gribble served as the Principal of the Anglican Collegiate School in Victoria, British Columbia. Sometime before 1881, Rev. Frank Gribbell and his family returned to England. At the time of the 1881 census, Francis B. Gribbell was shown living with his wife and three children, together with a young house servant, at 26 Queens Road, Erith, Kent. On the census return Francis Gribbell is recorded as the "Curate of Christ Church". Later that year, Rev. Frank Gribbell was appointed as the Vicar of Christ Church, Erith. Frank Barrow Gribbell served as the Vicar of Christ Church, Erith, for ten years, from 1881 until 1891. In 1891, Rev. Frank Gribbell arrived in the Sussex village of Ringmer, to take up the position of Vicar of the Church of St. Mary the Virgin. Rev. Frank Gribble resided at The Vicarage with his wife Elise ('Eliza') and their three children. Mrs Elise ('Eliza') Mary Ann Gribbell died at Ringmer in 1898. When the 1901 census of Ringmer was taken, Francis Barrow Gribbell, described on the census return as a sixty-one year old Church of England Clergyman, was residing at the Vicarage with his two unmarried daughters, Elizabeth Florence Gribbell, aged 34, and Gertrude Mary Gribbell, aged 34. Rev. Francis Barrow Gribbell, died at Ringmer in 1915, at the age of 75. Rev. Gribbell's son, Arthur Frank Gribbell, who had become a Captain in the Royal Artillery, was a casualty of the First World War, dying on 13th March 1916. [ABOVE] The Church of St. Mary the Virgin, Ringmer, photographed around 1910 by (George) Frank Burtt of Kingmoor, Ringmer. The Church of St. Mary the Virgin is believed to date from the 13th Century, but the bell tower is a relatively recent addition, constructed in 1884 as a gift from William Langham Christie of Glyndebourne, the Lord of the Manor. 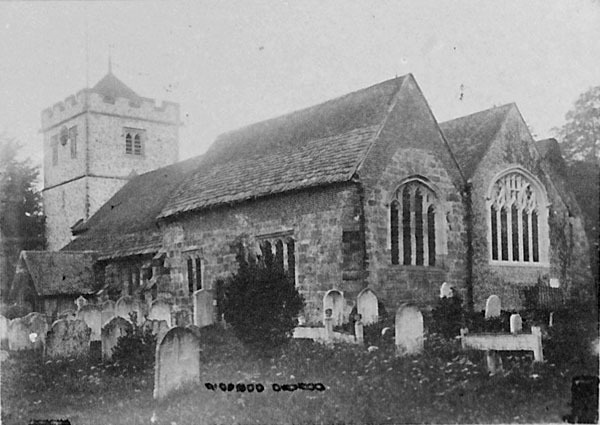 This photograph of the church appeared as part of a composite picture postcard published around 1910 by G. F. Burtt of Ringmer. [ABOVE] The interior of the Church of St. Mary the Virgin, Ringmer, photographed around 1910 by (George) Frank Burtt of Kingmoor, Ringmer. 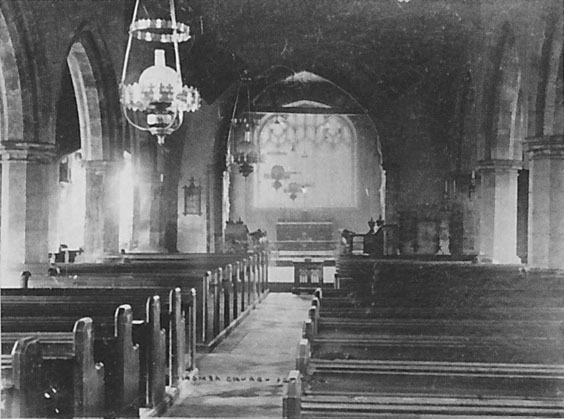 This photograph of the church interior appeared as part of a composite picture postcard published around 1910 by G. F. Burtt of Ringmer. [ABOVE] Ringmer Vicarage, the home of Rev. Frank Barrow Gribbell, Vicar of St. Mary the Virgin, Ringmer, photographed around 1910 by (George) Frank Burtt of Ringmer. Rev. Frank Barrow Gribbell (c1840-1915) lived at The Vicarage with his family from 1891 until his death in 1915. 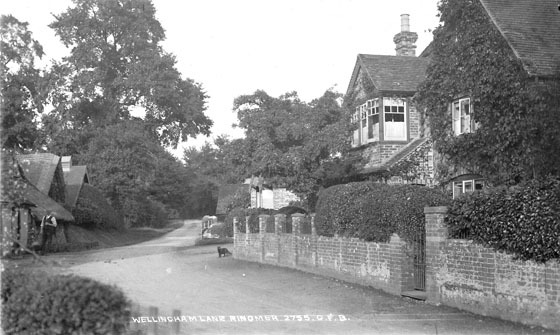 This photograph of The Vicarage appeared as part of a composite picture postcard published around 1910 by G. F. Burtt of Ringmer. I am indebted to Rendel Williams, who has produced a detailed account of the life and career of George Frank Burtt (1871-1949) on his Sussex Postcards Info website. I am grateful to John Kay of the Ringmer History Study Group for providing the set of photographs by George Frank Burtt featuring Rev. Frank Barrow Gribbell and the Church of St. Mary the Virgin, Ringmer. Other sources include the census returns for 1881, 1891, 1901 and 1911, and editions of Kelly's Directory of Sussex (1905, 1907, 1909, 1911, 1913). The following websites have been particularly useful: Genealogical Records on the Family Search website ; Registers of Births, Marriages & Deaths at the FreeBMD website ; National Archives website. Horace DABSON (born 1852, Ringmer, Sussex) - Photographer active in Ringmer during the 1880s. Horace Dabson was born in Ringmer, Sussex, in 1852, the son of Ann Hylands and George Dabson, an agricultural labourer who originated from Falmer. As a young man, Horace Dabson was employed in a variety of labouring jobs (carter, plate-layer, brewer's labourer, etc.). 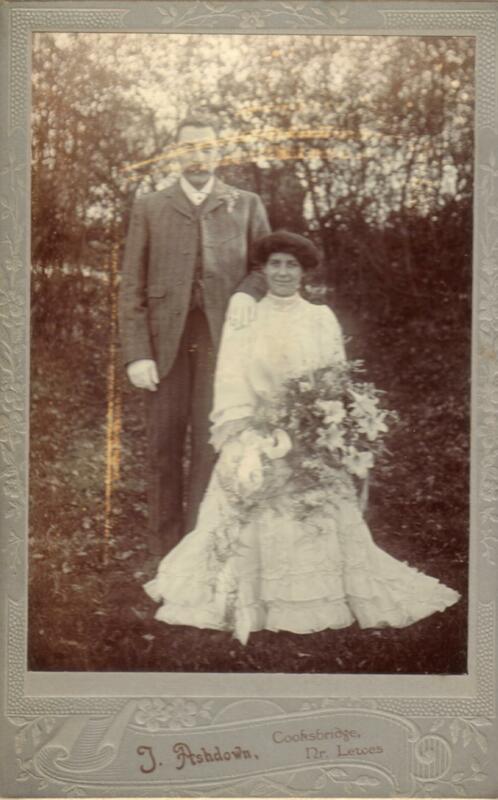 On 23rd October 1875, Horace Dabson married Catharine Herriott (born 1856, Ringmer, Sussex), the daughter of Louisa and William Herriott. Both Catharine and her father were employed by the Wellingham Brewery in Ringmer. During the 1880s, Horace Dabson was working as a brewer's labourer, but was taking photographs in his spare time. At the time of the 1881 census, Horace Dabson was living with his wife and two children at Wellingham in the parish of Ringmer. On the census return, Horace Dabson is described as a "Brewer's Labourer" so was probably employed at the Wellingham Brewery in Wellingham Lane. [ABOVE] Wellingham Lane, Ringmer, photographed around 1910 by (George) Frank Burtt of Ringmer. Horace Dabson lived in Wellingham Lane and worked in the local brewery shown on on the left. There is evidence that Horace Dabson was taking photographic portraits in the Ringmer area during the late 1880s. 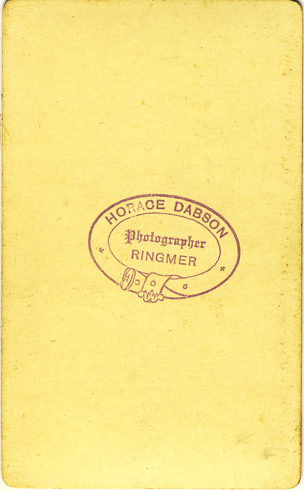 Although Dabson was not listed as a professional photographer in local directories, a number of cartes-de-visite portraits, rubber-stamped with a trade plate that reads "Horace Dabson, Photographer, Ringmer" do exist. By 1890, Horace Dabson had become the landlord of the Belle Vue Inn, a public house in Cross-in-Hand, a small Sussex village outside Heathfield. The 1891 census records 38 year old Horace Dabson as a "Licensed Victualler" at the Belle Vue Inn, Cross-in-Hand, Sussex. [ABOVE] Horace Dabson recorded as a "Licensed Victualler" at the Belle Vue Inn in Cross-in-Hand in the 1891 census. Horace Dabson disappeared from the area sometime during the 1890s. The 1899 edition of the Post Office Directory of Sussex lists Mrs Catharine Dabson as the proprietor of the Belle Vue. The 1901 census for Cross-in-Hand records Mrs Catharine Dabson as an "Inn Keeper" running the Belle Vue Inn on her "own account". 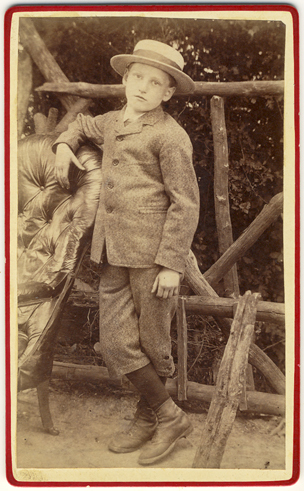 [ABOVE] A portrait of a boy wearing a straw boater hat, a carte-de-visite photograph by Horace Dabson of Ringmer (c1888). [ABOVE] The reverse of the photographic portrait shown on the left showing the trade plate of Horace Dabson, 'Photographer' of Ringmer, rubber-stamped on the back. [ABOVE] A vignette portrait of an unknown woman, a carte-de-visite photograph by Horace Dabson of Ringmer (c1890). [TOP RIGHT] A detail of the woman's portrait. 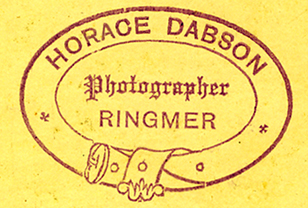 [ABOVE] Detail showing the trade plate of "Horace Dabson, Photographer, Ringmer", rubber-stamped on the reverse of a carte-de-visite (c1888). Jesse Ashdown was born in 1876 in the Sussex village of Chailey, ten miles north of Lewes. [The birth of Jesse Ashdown was registered in the district of Lewes during the 4th Quarter of 1876]. Jesse was the fourth child and eldest son of Ellen and Albert Ashdown, a brick and tile maker from Keymer near Hassocks in Mid-Sussex. Albert Ashdown was born in 1843 in the small village of Keymer, ten miles north of Brighton, the son of John Ashdown, a shoemaker. During the 2nd Quarter of 1869, Albert Ashdown married Ellen Cornford (born 1848, Barcombe, Sussex), the daughter of Hannah Walder and Samuel Cornford, an agricultural labourer. 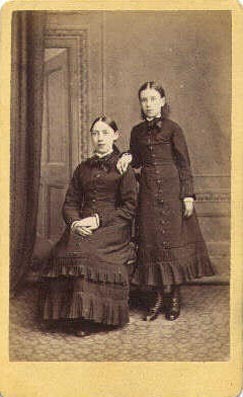 Later that year in the parish of Hamsey, Ellen gave birth to a daughter named Kate Ashdown, the first of ten children. Albert and Ellen Ashdown settled in Chailey, where Jesse and two elder sisters were born. Frances Betsey Ashdown was born in Chailey in 1872 and her younger sister Amelia Ashdown arrived two years later, towards the end of 1874. At the time of Jesse Ashdown's birth, his father Albert Ashdown was working as a tile-maker, probably at John & Richard Norman's brick works at Chailey. 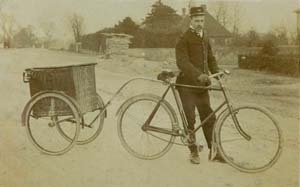 Not long after the birth of Jesse Ashdown in 1876, his father Albert Ashdown had a change of career, taking up the position of postman in Barcombe, a village to the north of Lewes. Albert Ashdown and his growing family set up home in Barcombe Street, Barcombe, where Albert, Ellen and their five children were recorded during the census of 1881. During their stay in Barcombe, Mrs Ellen Ashdown gave birth to four more children - Amos Robert Ashdown (born 1879), Minnie Ashdown (born 1881), Lloyd Ashdown (born 1884) and Owen Henry Ashdown (born 1886). Around 1888, Jesse Ashdown and his family moved to Hamsey, where his father Albert Ashdown found work as a brick and tile-maker, probably at James Chandler's Brickworks at Hamsey. Albert and Ellen Ashdown's last two children were born in Hamsey - Ellen Ashdown, who arrived during the 3rd Quarter of 1889 and Ethel Winifred Ashdown who was born in Hamsey during the 3rd Quarter of 1891. At the time of the 1891 census, Albert Ashdown and his family were living in the appropriately named "Brickyard Cottage" in Hewen Street, Hamsey. The enumerator described Albert Ashdown on the 1891 census return as a "Brick & Tile Maker", aged 47. Fourteen year old Jesse Ashdown was working as a "Cow Boy" and his younger brother Amos Ashdown was employed as a "Garden Boy". The fortunes of the Ashdown Family changed dramatically when Albert Ashdown, the main bread-winner died in 1895 at the age of 52. 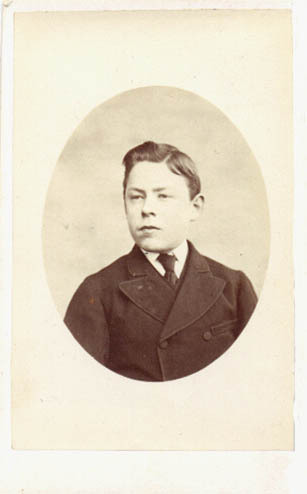 Jesse Ashdown, then aged18, had to adopt on his father's role by taking up employment in the Hamsey brickworks. His younger brother, Amos Ashdown later joined Jesse in the brickworks to help support their mother and their younger siblings. When the 1901 census was taken, three of the four Ashdown brothers, Jesse, Amos and sixteen year old Lloyd, were working as brick-makers, the youngest brother, Owen Ashdown, aged 15, had found employment as a florist. When the census was taken on 2nd April 1911, Jesse Ashdown was the only one of Ellen Ashdown's ten children still living at home. On the census return for Brickyard Cottage, Cooksbridge, the "Head of Household" is given as Mrs Ellen Ashdown, a sixty-three year old widow earning a living as a "Needlewoman". Jesse Ashdown, an unmarried man of thirty-three is described as a "Brickmaker", but there is evidence that by this date he was already supplementing his income by making picture-frames and taking photographic portraits in Cooksbridge and the Hamsey district. Soon after the census was taken in April 1911, Jesse Ashdown set himself up as a "Picture Frame Maker" at his house in Hewin Street, Cooksbridge. Jesse Ashdown is listed as a "Picture Frame Maker" at Hewin Street, Cooksbridge in Kelly's Directory of Sussex between 1911 and 1915 and although he does not make an appearance in the list of professional photographers detailed in the Trades Section of Kelly's Directory during this period, surviving examples of his photographic work, including the cabinet portrait of a bride and groom carrying the photographer's credit "J. Ashdown, Cooksbridge, nr Lewes" (illustrated on the right) provides evidence that he worked as a part-time photographer in Cooksbridge between 1907 and 1915. [LEFT] Jesse Ashdown listed as a picture frame maker in Hewin Street, Cooksbridge, Lewes, in the Trades Section of Kelly's Directory of Sussex, published in 1911. It was common for picture frame makers to take photographic portraits as a sideline. Leon Balk, who appears at the foot of this list, was a professional photographer in Bexhill-on-Sea between 1905 and 1915. 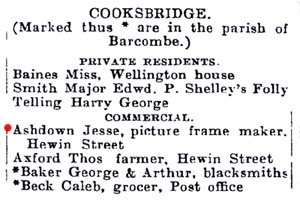 [ABOVE] Jesse Ashdown listed as a picture frame maker in Hewin Street, Cooksbridge in Kelly's Directory of Sussex, published in 1911. 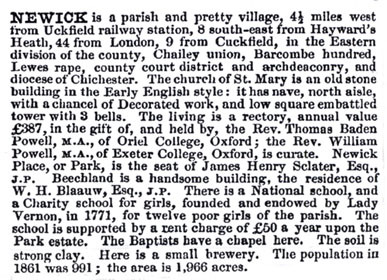 [ABOVE] The entry for Newick in the 1866 edition of Kelly's Post Office Directory of Sussex. 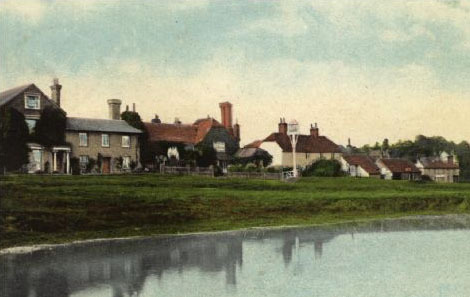 [ABOVE] An old postcard view of Newick showing The Green and the pond. The dark building with the light red roof and tall brick chimney at centre-left is The Bull Inn. John Funnell (1813-1887) was the son of William Baker Funnell of Chiddingly (1783-1859). John Funnell was born at Southease, Sussex, at the end of 1813 and baptised at the Jireh Chapel in Lewes on 9th January 1814. William Baker Funnell, John's father, was originally from Chiddingly, having been baptised at Chiddingly on 25th January 1783. William Baker Funnell married Lucy Crowhurst (born 1785, Hellingly) on 12th October 1803. William and Lucy Funnell's first four children were born in Chiddingly, but around 1810 he set himself up as a farmer in Southease, a parish 4 miles from Lewes. In the 1841 census, William Baker Funnell is recorded as a farmer in his mid-fifties. William and Lucy Funnell produced 6 daughters and 7 sons. John Funnell, the second eldest son of William and Lucy Funnell, married Hannah Pryor (born 1818, lewes) on 14th October 1842. John Funnell, a school master and land surveyor, fathered three sons and two daughters during his marriage to Hannah Pryor. John Funnell's first son Ebenezer Funnell was born in Southease in1843. A daughter named Eunice Funnell was born two years later. 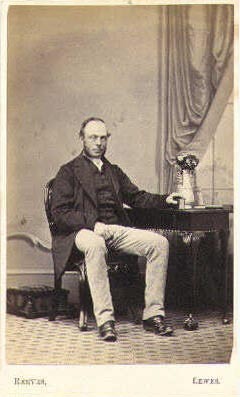 John Funnell's second son was born in Chailey in 1848 and named William Baker Funnell after his grandfather, William Baker Funnell of Chiddingly (1783-1859). 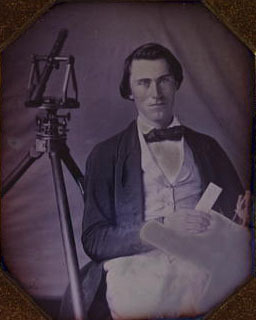 [ABOVE] A daguerreotype portrait of an un-named Land Surveyor, photographed around 1850. 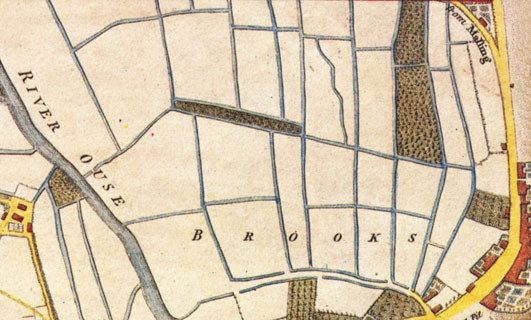 John Funnell was recorded as a Land Surveyor in Newick in the mid-1850s., [ABOVE] A detail from a map of land north of Lewes produced by James Edwards in 1799. John Funnell, a Land Surveyor based in Newick, produced plans and maps of land around Lewes between 1855 and 1880. William Baker Funnell, John Funnell's son, joined his father in his land surveying business in the 1870s. 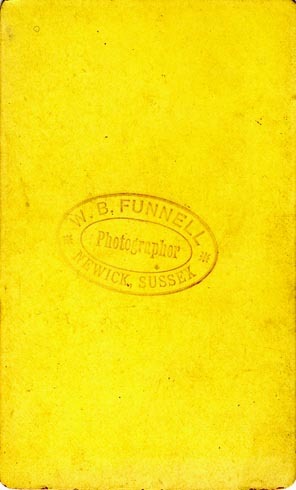 [ABOVE] The trade plate of William Baker Funnell, Photographer and Land surveyor of Newick, taken from a photocopy of the reverse of a carte-de-visite portrait produced around 1872. The original trade plate would have been printed in coloured ink. 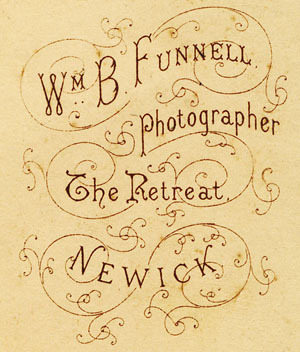 [ABOVE] The trade plate of William Baker Funnell, Photographer, The Retreat, Newick, taken from the reverse of a cabinet portrait produced around 1887. Previously based at Western Road in Newick, William Baker Funnell moved to a house called "The Retreat" after his marriage in 1878. William Baker Funnell was born in the Sussex village of Chailey during the 2nd Quarter of 1848, the second eldest son of Hannah Pryor and John Funnell, a land surveyor of Newick. William's father, John Funnell (born 1813, Southease, Sussex) was the son of William Baker Funnell of Chiddingly (1783-1859). On 14th October 1842, at All Saints Church, Lewes, John Funnell married Hannah Pryor, the daughter of John Pryor. The couple produced at least 5 children - Ebenezer Funnell (born 1843), Eunice Funnell (born c1845), William Baker Funnell (born 1848), Alfred Funnell (born 1850) and Lucy Funnell (born 1854). In 1856, a year or so before her 40th birthday, Hannah Funnell died. The following year, John Funnell married Mary Ann Pryor (born c1810, East Hoathly), possibly a sister or relative of his first wife. [The marriage of John Funnell and Mary Ann Pryor was registered during the 2nd Quarter of 1857]. At the time of his second marriage, John Funnell (1813-1887) was combining his duties as a Land Surveyor with his other role as the proprietor of a school in Newick. John Funnell had previously worked as a school master at Chailey and Newick. Other sources mention that John Funnell was a "self-taught landscape painter" and an "author of poems". By the 1870s, John Funnell was concentrating on his main work as a land surveyor. In 1878, William Baker Funnell married Alice Nora Duplock (born 1852, Lewes, Sussex), the youngest daughter of Ann Eliza Bridger and William Duplock, a plumber & painter of Lewes. The couple set up home at a house called 'The Retreat' in the village of Newick, 8 miles north of Lewes. By this date, John Funnell had brought his son William into his land surveying business. 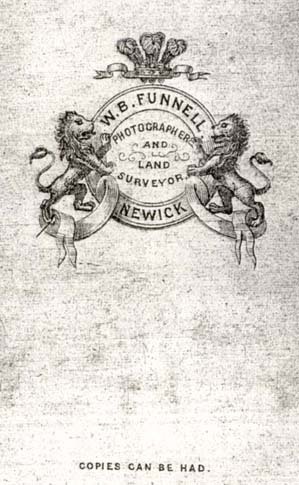 In the commercial section of the 1878 edition of Kelly's Post Office Directory of Sussex, the firm of J. Funnell & Son of Newick appears in the list of professional surveyors. The 1881 census records both John Funnell and his son William Baker Funnell in the village of Newick. John Funnell is shown living at 1 Western Road, Newick, with his second wife Mary and three grandchildren. On the census return John Funnell is described as a sixty-eight year old "Land Surveyor". William Baker Funnell had served as Clerk to the Newick School Board since 1875 and when the census return was taken on 3rd April 1881, his occupation was given as "Land Surveyor & Attendance Enquiry Officer to School Board". 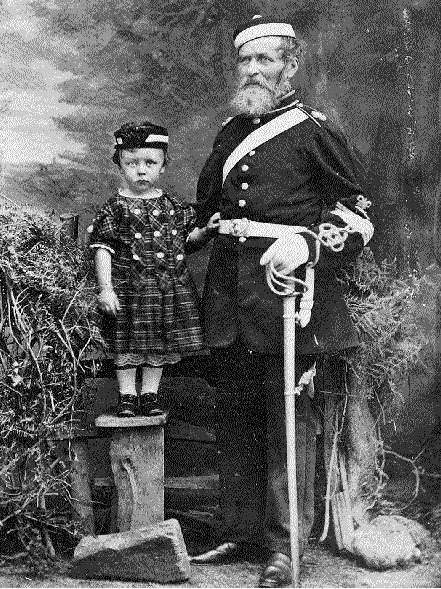 William Funnell's wife Alice had given birth to a baby girl named Constance early in 1881. When the 1881 census return was completed, thirty-three year old William B. Funnell was living at The Retreat, Newick, with his twenty-eight year old wife, their three month old baby, and Marian Duplock, his wife's elder sister. The household was completed by two domestic servants - Sarah Stonham, a twenty-one year old woman from Lewes, who was nursemaid to baby Constance, and Emily Chatfield, a sixteen year old general house servant. John Funnell, William Baker Funnell's father, died in May 1887 at the age of 74. Local trade directories published in the 1890s, show that William B. Funnell was still working as a Land Surveyor and serving as a Clerk to the Newick School Board, but his duties as a School Attendance Officer had been taken over by Alfred Tidy. By the end of the decade, William Baker Funnell had moved to Lewes. The 1899 edition of Kelly's Directory of Sussex records William Baker Funnell at 3 Grange Road, Lewes, but he also appears listed as a surveyor and Clerk to the School Board in Newick. The 1901 census records William B. Funnell and his wife Alice at an address in the St Anne district of Lewes. William B. Funnell is described as a "Land Surveyor", aged 53, on the census return. Constance Funnell (born 1881, Newick, Sussex), William and Alice Funnell's only child, was living away from her parent's home in 1901. Twenty-year old Constance Funnell was residing in the Sussex village of Ticehurst, where she was employed as a "Private Governess". Alice Nora Funnell, William B. Funnell's wife, died in 1917, aged 65. William Baker Funnell died in 1938 at the age of 90. [The death of William Baker Funnell was registered in the district of Lewes during the 4th Quarter of 1938]. All through his working life, William Baker Funnell was described as a "Land Surveyor", yet surviving photographs which carry his name show that he was also a part-time photographer. A carte-de-visite portrait which dates from around 1872 has, on the reverse of the card, an elaborate printed trade plate with the words "W. B. FUNNELL, Photographer and Land Surveyor, NEWICK". 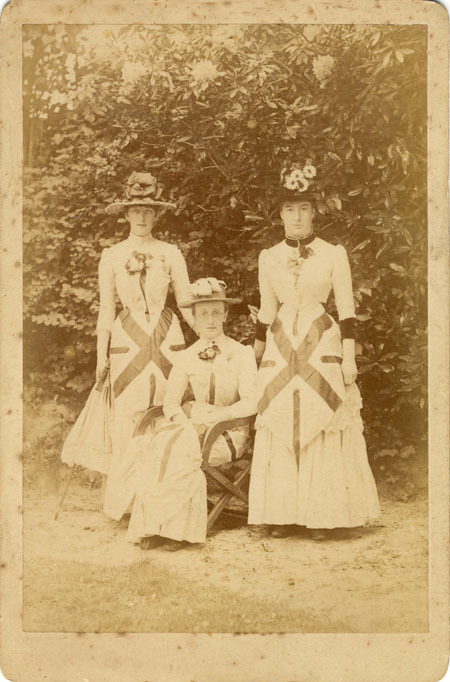 A cabinet portrait featuring three young women, wearing dresses decorated with the "Union Jack", probably dating from 1887, carries, on the reverse of the card mount, the creator's trade plate "Wm. 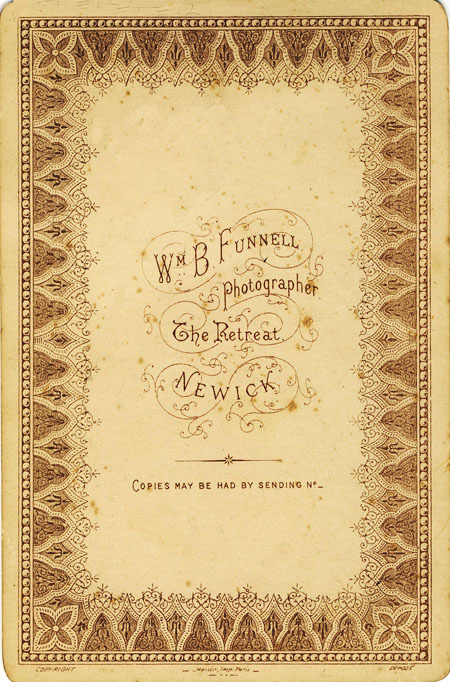 B. FUNNELL, Photographer, The Retreat, NEWICK". Although these surviving photographs provide evidence that William Baker Funnell was producing photographs over a period of about twenty years, I have not found his name listed under the heading of professional photographers in the local trade directories published between 1870 and 1890. [LEFT] William Baker Funnell listed as both a surveyor and a clerk to the school board at Newick in the 1890 edition of Kelly's Directory of Sussex. Funnell's name does not appear in Kelly's trade list of professional photographers in Sussex. 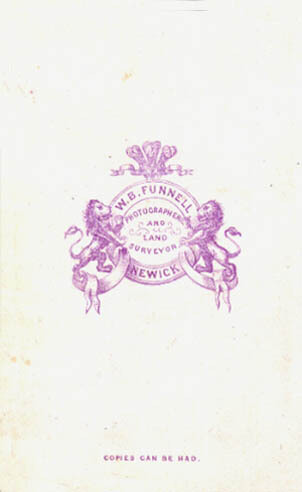 [ABOVE] The reverse of a carte-de-visite produced by William Baker Funnell of Newick , printed with the credit "W. B. FUNNELL, Photographer and Land Surveyor, NEWICK" (c1874). W. B. Funnell of Newick was in business as a photographer for around 20 years between 1870 and 1890. [ABOVE] A portrait of a teenage lad, a carte-de-visite photograph produced by William B. Funnell of Newick (c1874). 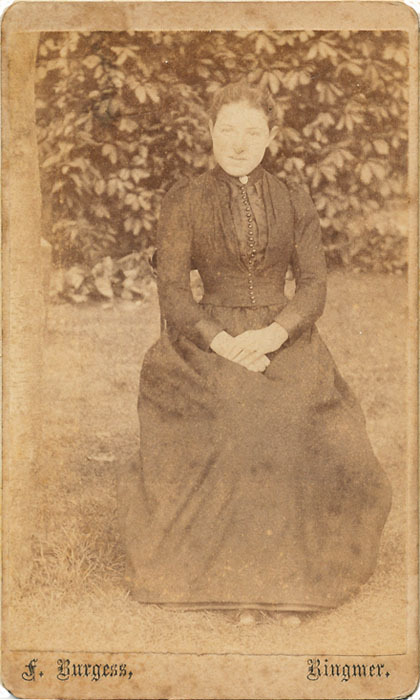 Although never listed as a professional photographer, W. B. Funnell was taking portraits in the Newick area from the early 1870s until about 1890. Dr Frank Graveley (1857-1919) was the son of Dr Richard Graveley (c1821-1901), a surgeon and medical officer of health for the Chailey rural sanitary authority and the Chailey union workhouse and Medical Superintendent of the Newick Cottage Hospital. 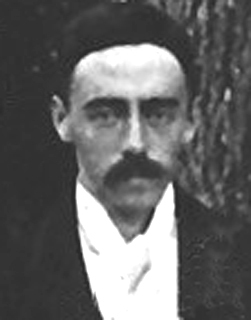 Frank Gravely was born in Newick in 1857, the eldest son of Dr Richard Graveley and Mary Colgate. In 1883, Frank Graveley, then a young surgeon, married Kate Boxall (born 1861, Wisborough Green, West Sussex). The couple set up home at a house called "Homelea" in Newick, Sussex. The union of Frank Graveley and Kate Boxall produced three sons - Frank Vernon Graveley (born 1885, Newick, Sussex), Henry Guy Graveley (born 1888, Newick, Sussex) and Thomas Brian Graveley (born 1894, Newick, Sussex). Both Frank Vernon Graveley, generally known as Vernon, and his brother Henry Gravely later became mechanical engineers, specialising in automobiles. 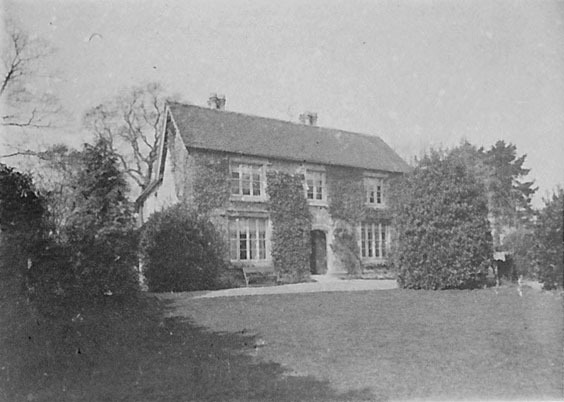 In 1911, Dr Frank Gravely, his wife Kate and their three sons were living at "Greenfields", the family home in Newick, once the residence of Dr Richard Gravely, Frank Gravely's father. 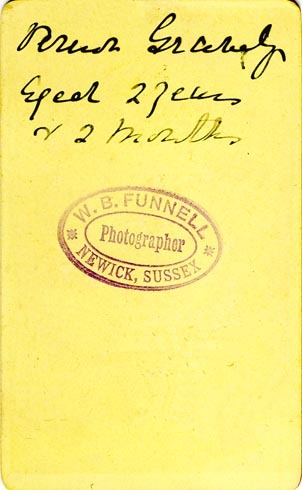 [ABOVE] The trade plate of William Baker Funnell, photographer of Newick, rubber-stamped on the reverse of a carte-de-visite (c1888). 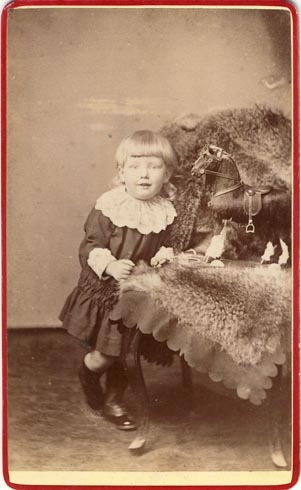 [ABOVE] A portrait of Frank Vernon Graveley, "aged 2 years and 2 months", a carte-de-visite photograph produced by William B. Funnell of Newick (1887). [ABOVE] The reverse of the portrait (left) by William B. Funnell of Newick , showing the written inscription "Vernon Graveley, aged 2 years and 2 months" (1887). [ABOVE] The reverse of the portrait (right) by William B. Funnell of Newick, showing the written inscription "Vernon Graveley, aged 2 years and 2 months" (1887). 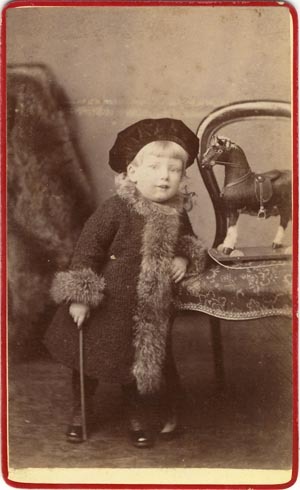 [ABOVE] A portrait of Frank Vernon Graveley, "aged 2 years and 2 months", a carte-de-visite photograph produced by William B. Funnell of Newick (1887). In adult life, Vernon became a mechanical engineer. 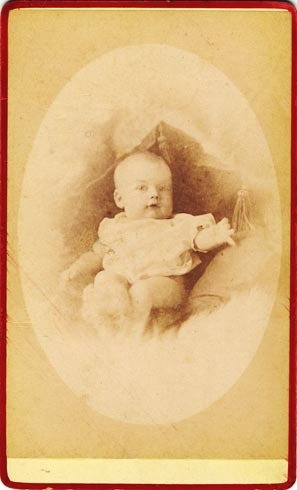 [ABOVE] A portrait of a baby, possibly Frank Gravely's second son, Henry Guy Graveley (born 1888, Newick, Sussex), photographed by William Baker Funnell of Newick (c1888). [ABOVE] The reverse of a cabinet portrait produced by William B. Funnell, a photographer based at The Retreat in Newick, a Sussex village 8 miles north of the county town of Lewes. The elaborate trade plate was printed by Marion & Co. of Paris, a firm that specialised in the production of photographic mounts. Roger Vaughan has devised a method of dating Marion & Co.'s printed card stock from the format of the printer's trade mark. Roger Vaughan has discovered that it is possible to date a photograph from the layout of the name "Marion Imp Paris" at the foot of the card. Roger Vaughan has discovered that a system of dots and dashes around the printer's name provides a sort of "date code". The format of the dots and dashes around the printer's name on this example suggests a date of 1887. (see the example opposite). [LEFT] The "dash-dot-dot-dash" code under the trade mark Marion, Imp Paris matches a date of 1887. I am grateful to the anonymous person who has researched the Funnell Family of Sussex and placed the fruits of his or her labour on the website entitled Descendants of Thomas Funnell and Mary Unstead. Other sources include the census returns for 1841, 1851, 1861, 1871, 1881, 1891, 1901 and 1911, and various local directories, including Melville & Co.'s Directory of Sussex (1858) and editions of Kelly's Directory of Sussex (1851,1855,1862,1866,1867,1878,1882,1887,1890,1891,1895,1899,1907, 1909, 1911,1913 & 1915). The following internet resources have been particularly useful: Genealogical Records on the Family Search website ; Registers of Births, Marriages & Deaths at the FreeBMD website ; National Archives website. I am grateful to Roy Edge of the Family Documents website for providing the carte-de-visite by William Baker Funnell of Newick.